MicroSD cards are increasing in capacity. The latest consumer-friendly capacity available at a somewhat reasonable price (as of the time of this writing) is the 256GB card. Yes, 256GB on an itty-bitty card so small you could lose it in a vacuum cleaner, accidentally dump it in the trash, and wonder where it went…and given its cost, you would probably cry in the meantime. 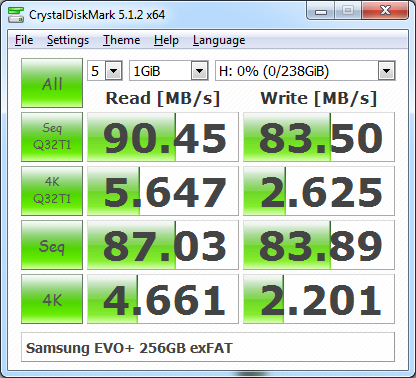 Today’s microSD card is the Samsung EVO+ 256GB with a UHS speed class of 3 (U3). The box claims “up to 100MB/s read and 90MB/s write speeds.” Hmm, we shall see. Box claims always tend to be exaggerated — especially when the fine print on the back indicates that the actual transfer speed might be lower for whatever reason. Nonetheless, this card does produce decent results, and it is 100% compatible with Linux. Let’s look at a few benchmarks. Officially, the Samsung EVO+ 256GB card is advertised as a Class 10, UHS-I, U3 microSDXC card. The specific part number according to the package is MB-MC256DA/AM. 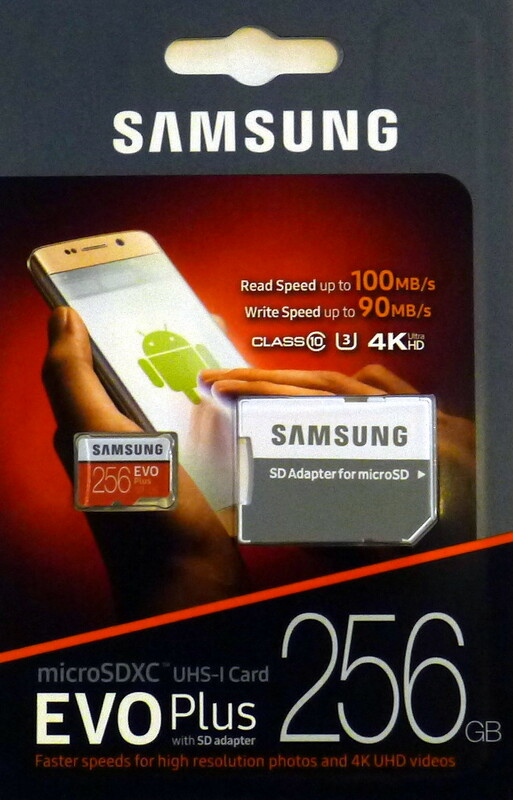 Samsung EVO+ 256GB MicroSDXC Card Packaging. Model MB-MC256DA/AM. Includes the card and an SD adapter. Nothing else except the seemingly confusing Class 10/UHS-I/U3 logos on the front. Which minimum speed is it? 10MB/s or 30MB/s or compatible with both? These acronyms can appear confusing and self-conflicting when used together on the packaging. According to the official SD Association site that explains the difference in UHS speed classes, UHS-3 and U3 refer to a minimum sustained write speed of 30MB/s. However, Class 10 refers to a minimum sustained write speed of 10MB/s. So, which is it? Also, the card touts UHS-I. Is this the same as U1, which designates a minimum sustained write speed of 10MB/s, which is the same speed rating as Class 10? Is it referring to UHS bus speed, not the speed class? Consumer experts might condescendingly nitpick about how “this all makes sense if you know what to look for,” but for us mere mortals who simply want a microSD card compatible with Linux that possesses write speeds faster than the cheaper UHS-1 (U1) and Class 10 cards, let’s move on and look at this card. Sidenote: If ever in doubt about the speed of a card, look at the price. Authentic, more expensive microSD cards from reputable sellers usually have the faster read and write speeds. You (usually) get what you pay for. Rather than ponder about the printed speed ratings, let’s plug this into a computer via USB3 and run some benchmarks. I performed informal tests in Windows 7 with CrystalDiskMark 5.1.2 and Linux Mint 18.3 with the builtin Disks benchmarking program. The card was connected to a computer using a USB3 microSD adapter. The card ships preformatted with exFAT. About 90/83 MB/s read/write speeds are good, and matched what I was expecting. 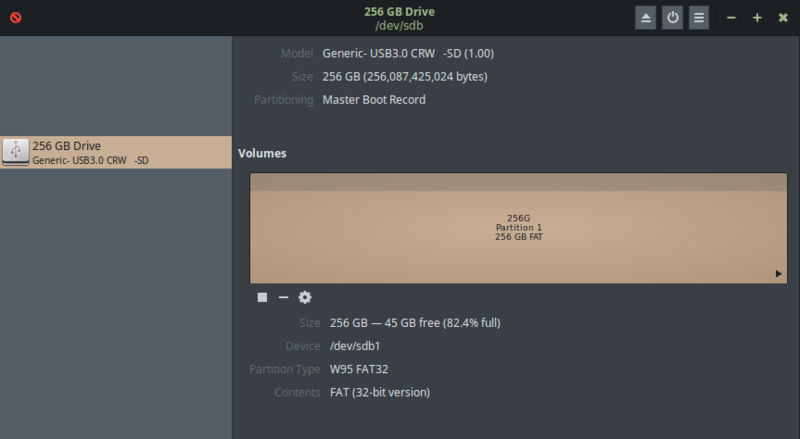 exFAT is useless for me due to issues with Linux, so I reformatted the card to FAT32. Even though the card has a raw capacity of 256GB, the formatted capacity will be about 238GB, which is 7% less, regardless of exFAT or FAT32. FAT32 Formatted. Still good numbers. Keep in mind that duplicate benchmark numbers rarely appear. There will always be fluctuations as seen here. The results are comparable, so I am happy. Let’s see how the card performs with Disks in Linux Mint. Only uses FAT32 tested. No exFAT. Disks in Linux Mint 18.3. FAT32. 100x10M Test. Writes were very slow when transferring 100 samples of 10MB each. The writing began high, but quickly reduced to about 8MB/s for the majority of the process before jumping to ~29MB/s near the end. 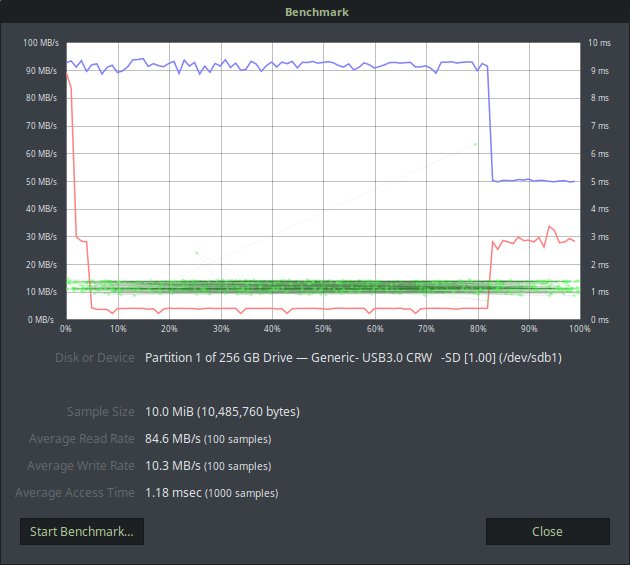 Reads remained fairly consistent at ~90MB/s until the 80% near the end. This test demonstrates that the card meets the Class 10 rating. 100x100M Test. Write speeds are better and meet the average sustained minimum of 30MB/s designated by the U3 speed rating. 3x1000M Test. This is more like it. With larger sample sizes, the write speed improves. Benchmarks are fine, but I wanted to get a feel for the card’s performance during everyday usage, so I copied about 200GB of random files to the card. Watching the Linux file copy dialog showed a consistent ~40MB/s write speed. For everything copied to the card, ~40MB/s was the apparent expected result. Sometimes higher, sometimes lower, but I observed ~40MB/s most of the time. Maybe the card writes faster depending upon the size of the files? I noticed that large files (100MB+) tended to transfer at higher write speeds than many small files (10KB-10MB). Read speeds are faster. 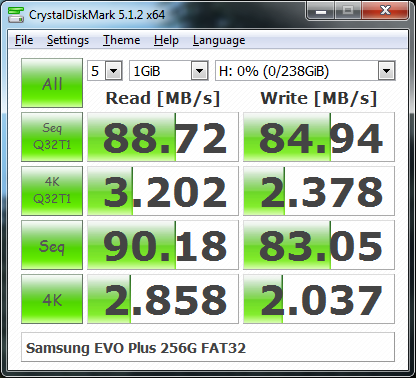 Once the data is written to the card, I always experienced fast, snappy reads at ~70-90MB/s for non-fragmented data. It, too, would vary at times, but the read speed was always faster than the write speed. Overall, the performance is good. No microSD card I have tried has ever lived up to its box claims, so the results are within reasonable real-world expectations. I mainly wanted a card with faster write speeds (hopefully 30MB+ MB/s) than existing Class 10 cards, and the Samsung EVO+ was a worthwhile purchase. Will it reach the advertised “up to” 100MB/s read speeds? Maybe, depending upon the type of data transferred and possibly the interface, but I have yet to see it. For everyday usage, this card has definitely proven to be reliable and faster than expected, so I am happy. This entry was posted on February 12, 2018, 5:54 PM and is filed under linux. You can follow any responses to this entry through RSS 2.0. You can leave a response, or trackback from your own site.